"The Future of Contact Centers Rests on the Edge-Cloud Contact Centers"
The future of contact center are more likely to get augmented with “edge” computing and the ability to meet today’s requirements while preparing for tomorrow’s is already within reach. In the case of contact centers, putting the combined burden of media processing of multichannel platforms (voice, email, chat, text) and the exponential levels of data generated, processed, and stored for every interactive communication in the cloud is by no means a small undertaking. 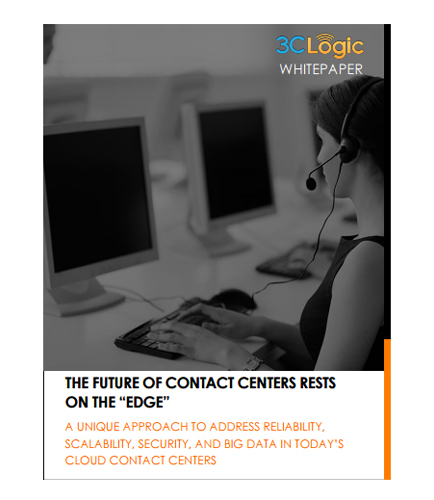 In this white paper, discover how a unique distributed approach to cloud contact centers can enhance business continuity, resilience, security, and big data analysis. Not many companies make it easy for people to do business with them.Is your organization easy to do business with? If the answer is no, then this white paper may be helpful to examine the key aspects of your customer interactions. By doing so, you will gain invaluable insight into your strengths, and the areas you need to work on. This white paper on “The Top 10 Ways to Tell if You Are Easy to Do Business With,” will review the top 10 areas and give insight into these important aspects of your business. Great CX starts from within your company, so it is important to examine some of the key aspects like: Baseline Rating: Rate your business to know if you are easy to work with Social Media Strategies: To ensure that the customer engagement and response are very effective Being easy to do business with:Building a better business with great customer experience Your Website: Must be easy to navigate, current, comprehensive and appealing Together we will make marked improvements in overall satisfaction and help you become an organization that is easier to do business with. For executives, measuring and improving call center metrics can be a pain point. Your call center operates in a stressful environment where good quality call center performance metrics lead to a higher standard of customer service. In this white paper on “The Executive Guide to Improving 6 Call Center Metrics,” you'll find how to improve 6 key call center metrics for better performance and future success. Customer Satisfaction (C-Sat): To keep service costs low, while maintaining high caller satisfaction Service Level: what your call center can reasonably achieve First-Call Resolution (FCR): Focus on three areas- people, process, and product to improve the call center metrics Average Handle Time (AHT): 5 methods to help your call center improve AHT This white paper guide includes information on how strategic and tactical teams should work together on call center metrics reporting and its best practices.